Other books that bore by Mr. Phelger (including the utterly actionless but much-loved by my son The Whales Go By), first turned me off of this writer, but I have since become a convert. This story is especially cool because it follows a tagged salmon on his trip downriver and then return to spawn. Totally cool for teaching a kid about nature and such things. Plus, Arnold Lobel almost never disappoints. I mean, geez, the guy illustrated everything. Including writing Frog and Toad for god's sake! A little digging online shows Fred Phelger to be an utterly fascinating human being. Phleger received three degrees in geology, an A.B. degree from the University of Southern California in 1931, an M.S. from the California Institute of Technology in 1932 and a Ph.D. from Harvard in 1936. Phleger's early work in paleontology concerned Ordovician fossils, Lichadian trilobites, and Pleistocene cats. And Phleger received the 1980 Joseph A. Cushman Award which recognized Phleger as a pioneer of modern marine geology whose work "had considerable impact on the development of paleoecology and paleoceanography, both in deep-sea research and in the study of shallow marine deposits. Phleger had a literary career as well as a scientific career. His wife, Marjorie Temple Phleger, taught drama at the Bishop School when they first arrived in La Jolla. She later became public relations head at the La Valencia Hotel, which was owned at the time by oceanographer Gifford Ewing. While there she met many actors and writers, including Clark Gable and Tennessee Williams. She was a columnist for the San Diego Union and the La Jolla Light. She was a founder of the original La Jolla Playhouse. The Phlegers became acquainted with Ted Geisel and his wife Helen in the early 1950's. Geisel encouraged the Phlegers to write children's books and introduced them to the editors of Beginner Books at Random House. Marjorie Temple Phleger first wrote a survival book, Pilot Down, Presumed Dead. 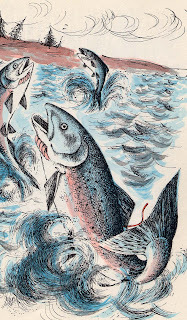 In 1959, Fred Phleger published The Whales Go By and Ann Can Fly and in 1960 Red Tag Comes Back. He and his wife published You will Live Under the Sea and Off to the Races in 1966. I am thoroughly captivated by the fact that someone with such a renowned scientific pedigree would go on to meet Dr. Seuss and have a legacy such as this. Very cool. I love how incestuous children's books in the 60s were. You mentioned Marjorie Phleger's Pilot Down, Presumed Dead in passing. I highly recommend this book, although it may be a bit early to introduce your son to it. I first read it some 25 years ago, when I was about ten years old, and I read it many times thereafter. It was one of several books from my childhood that I will never forget. thanks Dave. that book sounds like one my husband would have flipped for when he was young, so I know that we'll be picking it up. i was just thinking about that the other day, that as my son gets older, the content of this blog will change slowly over time. here's hoping he stays a reader! i read and still have hard back copy red tag comes back from the 60,s . great book . simple . fish grows up . lives his life. comes home to spawn and die. This was the first book I read, fifty five years ago.It had a great impact on me. I still love reading and nature, especially aquatic environments. It is wonderful to see that it has not been forgotten.